Pedro Giraudo has collaborated with Grammy award winner Pablo Ziegler, 9 time Grammy award winner Paquito D'Rivera, Latin American icon Ruben Blades, and Dizzy Gillespie's protégé William Cepeda, as well as 'Tango meets Jazz' guests: Branford Marsalis, Kenny Garret, Regina Carter, Nestor Torres, Miguel Zenon among many others. Pedro Giraudo has also been the musical director of Mariela Franganillo Company's "Tango Connection" and "Tango Recuerdo" and performed with U.S.'s most prominent tango ensembles including Hector Del Curto's Eternal Tango, Fernando Otero's X-Tango and Daniel Binelli's 'Tango Metropolis'. He has participated in numerous jazz and music festivals throughout the North America, Europe, Latin America, the Caribbean and Asia, and performed in venues such as The Blue Note (Japan & USA), Birdland (Austria), London's Queen Elizabeth Hall, Jazz Festival Royale in Thailand, Kennedy Center (Washington DC), Iridium, Jazz Standard, Blue Note, Lincoln Center and Carnegie Hall (NYC). As a composer and arranger, Giraudo leads his 13-piece ensemble, the Pedro Giraudo Jazz Orchestra, and has been hailed by critics as one of the most creative and daring bandleaders on the scene today. His compositions combine his love of classical forms, Argentine tango and folk music, and the spontaneity of jazz improvisation. The band, which boasts some of New York's finest jazz musicians, has performed regularly in the most prestigious jazz clubs in the New York City area, including the Jazz Standard, Birdland, The Jazz Gallery, Blue Note, Joe's Pub, as well as abroad. John Murph of Downbeat described Giraudo's music as "an opulent listening experience of modern, orchestral jazz, brimming with passionate improvisations, deliberate contrapuntal melodies and plush harmonies. Pedro Giraudo has also conducted the world renown WDR Big Band and Cologne Contemporary Jazz Orchestra. His discography includes 'Córdoba' (Zoho Music 2011), 'El Viaje' (2009) , 'Desconsuelo' (2005), 'Mr Vivo' (2002) and 'Destiny of Flowers' (2000). 'Córdoba' won 2011 Latin Jazz Corner's: "Latin Jazz Large Ensemble Album Of The Year", "Latin Jazz Boundary Breaking Album Of The Year"," South American Jazz Album Of The Year", and "Latin Jazz Composition Of The Year"; while 'El Viaje' won 2010 "Best Latin Jazz Album Of The Year," and "Best Latin Jazz Large Ensemble Album Of The Year," as well as "Best Latin Jazz Composition". In 2008, Giraudo was awarded a composer's commission through the Jazz Gallery in New York, for a new work for his large ensemble; and in 2010, he was commissioned by the JazzReach initiative to compose a new work for their Big Drum/Small World main-stage program. He has played bass on dozens of recordings for the world's leading labels including Sony, Warner, Nonesuch, Naxos and Harmonia Mundi, as well as for independent projects, and on movies including Oliver Stone's 'Wall Street II'. 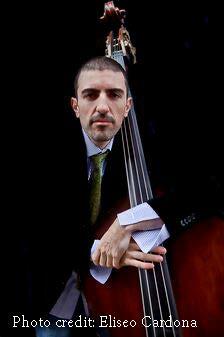 He is also the principal bassist of the Hudson Symphony Orchestra and the Música de Cámara String Ensemble. Pedro Giraudo is endorsed by the gold standard in string makers, D'Addario, and the outstanding Keeley Electronics.